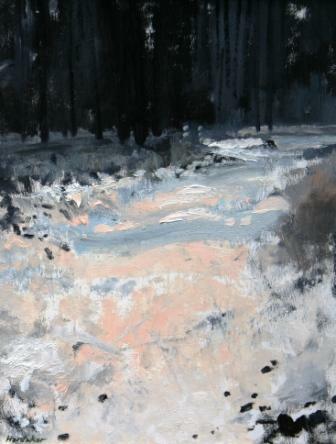 In ''Path Through the Forest'' Charles Hardaker shows his skill at capturing atmosphere and form. The dark forest contrasts with the light stone path to create a real sense of place. Colour is a very important element in Charles Hardaker''s contemporary paintings. He uses a muted palette of neutral and earthy colours, which simplifies his work in the sense that light and form can be explored without distraction. There is a great feeling of stillness and calm in his art work.